Memory is a central element in defining modern Jewish identity. As we look to Israel's future, we need to engage anew with our past and explore its meanings and consequences. 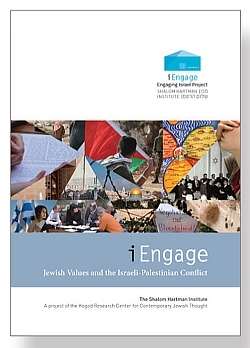 Through the consideration of major historic moments, this iEngage Project series grapples with the different ideas and values that shape the meaning of modern Israel, Zionism, and Jewish identity today. This innovative new course explores the pivotal events of 1947 and 1967 - following the 1917 Balfour Declaration - as key moments when Zionism unleashed new thinking about the meaning of Jewishness for generations to come. The course engages Jews in an open and pluralistic discussion about issues of Jewish identity, peoplehood, ethics, and theology, as they relate to nationhood, land, sovereignty, Jerusalem, occupation, and moral red lines. Each session in this eight-unit course includes a 20-35 minute video lecture and a 20-30 minute roundtable video discussion with senior Hartman faculty, as well as primary sources and background readings. Cost: $500 includes online access to digital course, leader’s guide, sourcebook, and background readings. Additional hard copies of sourcebooks sold separately, $20 each (includes shipping and handling).